The quick-growing drought-resistant Moringa plant (Moringa oleifera) is native to northern India, where it’s been used since at least 150 AD as a food and for its medicinal properties. In classical times, the Romans and Egyptians made perfumes and lotions from the oil of Moringa seeds; the use of Moringa oil in this fashion continued well into the 1800s. Although Moringa seeds, bark, root, fruit, and flowers are all edible. 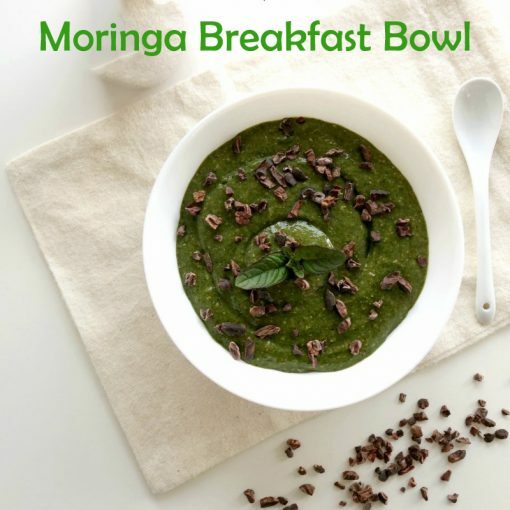 Its nutrient-packed leaves are the primary source of Moringa health benefits and the part most commonly used. Moringa leaves are eaten fresh, cooked like a vegetable, or dried and powdered and sprinkled on food and in soups or sauces in many parts of the world. 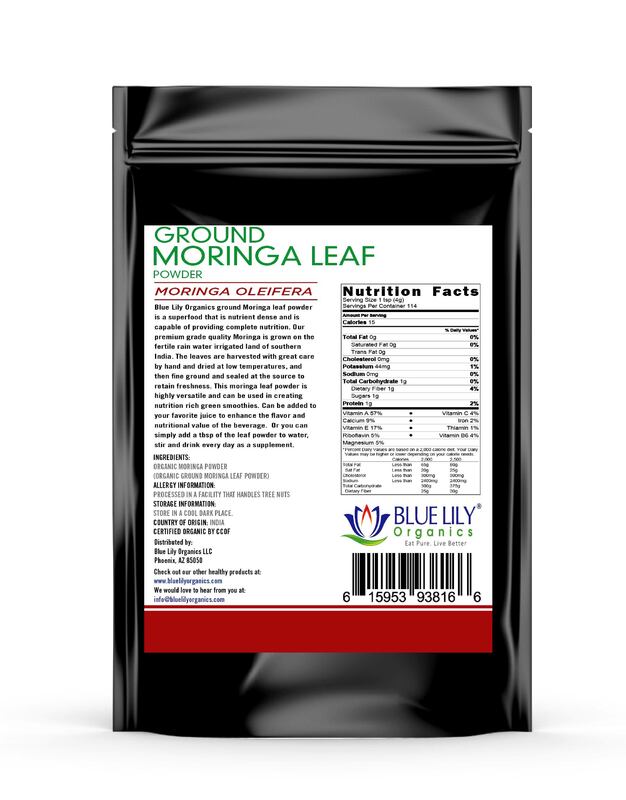 Blue Lily Organics Moringa Leaf Powder uses the young leaves of Moringa trees. They are carefully harvested and cleaned, then dried at very low temperatures to preserve their valuable nutrients. The dried leaves then ground into a fluffy, fine powder. Moringa tree is so fast-growing (second only to bamboo), so it considers as a renewable resource. In fact, the process of harvesting the leaves actually encourages the tree’s foliage to grow back even thicker and healthier than before. With a rich, deep green color and slightly nutty flavor, Blue Lily Organics Best Moringa Powder is nutrient-dense and easy for your body to assimilate. Moringa is “the most nutrient-rich plant ever studied,” and here’s why: just one gram of Moringa leaf powder contains seven times more vitamin C than oranges, four times more calcium, and twice as much protein as milk, three times the iron in spinach, four times more vitamin A than carrots, and three times the potassium in bananas. 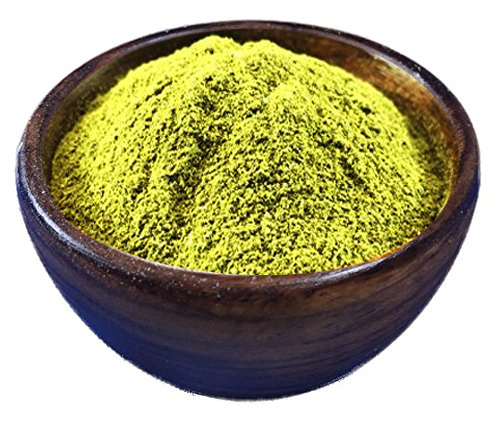 Moringa leaf powder is also a significant source of beta-carotene and iron. The nutrients in Blue Lily Organics Best Moringa Powder are present in a whole, food-based form, making them easier to absorb than the isolated vitamins and minerals found in over-the-counter vitamin formulas. Because of Moringa’s unique “superfood” status, both the World Health Organization and the European Union have worked to support its cultivation in regions that suffer from malnutrition. WHY SHOULD I USE MORINGA: Moringa Leaf Powder is a rich source of vitamins, minerals, and amino acids. Moringa Leaf Powder provides highly essential nutrients, increases the natural defenses of the body. Rich in Antioxidants. It contains significant amounts of vitamin A, C, and E; Calcium, Potassium, and Protein. Moringa helps to combat malnutrition, especially among infants and nursing mothers. This is the reason it is also called the Green Super Food Supplement. 100% NATURAL, PURE AND RAW: Moringa Leaf Powder helps stabilize your mood, improves the Immune system, promotes proper digestion, increases Energy level and keep you healthy. Moringa carefully sourced from a small farm and dried to a fine powder at the ideal low temperature to preserve its precious nutrients and packaged to maintain freshness and purity. VERSATILITY: Blue Lily Organics Moringa Leaf Powder can also use in the kitchen to add a healthful boost to any dish. 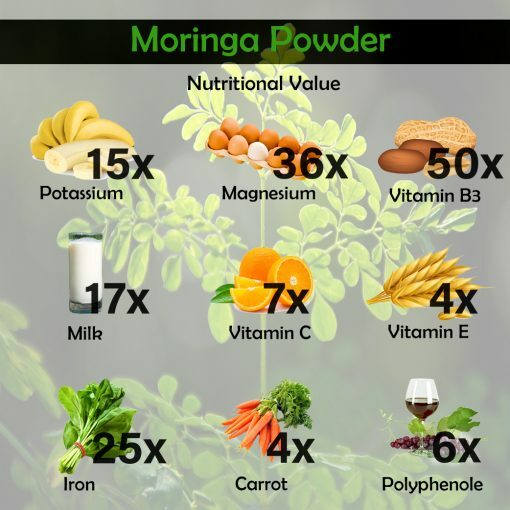 Best Moringa powder is particularly yummy in sauces and soups, where it works as a thickener while providing delicious, nutritious flavor and aroma. Take it naturally in powder for higher concentration, quicker absorption, easier on the stomach. USDA CERTIFIED: 100% Vegan, USDA Organic. Non-GMO, and contains no chemical pesticides, artificial additives or preservatives. 100% MONEY BACK GUARANTEE: Try our Best Moringa Powder. If you do not like our product, we will simply issue refund request. No questions asked. That’s our iron clad guarantee. Moringa leaf powder works to nourish the whole body. It contributes to the overall healthy energy levels and feelings of well-being. The human body needs sufficient amounts of certain nutrients to function optimally. Best Moringa powder can support this healthy functioning by providing nutrition the body needs to operate at its best. Moringa leaves shows to possess qualities that contribute to many additional Moringa health benefits. It promoting a healthy immune system, healthy blood sugar levels already within normal ranges, cardiovascular health, and more. extract. 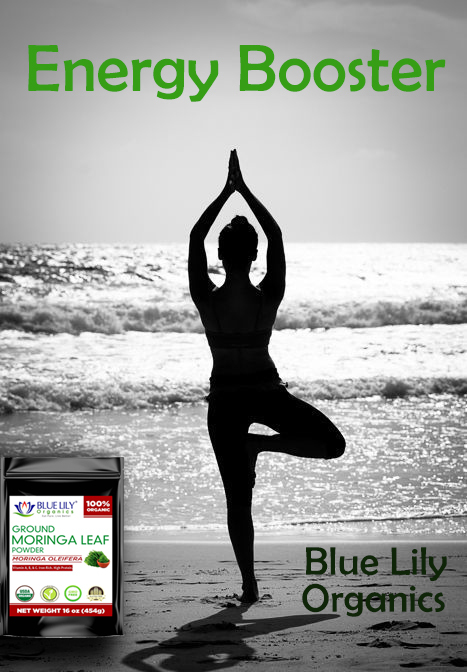 To reap myriad of health benefits use Blue Lily Organics Moringa Leaf Powder daily. 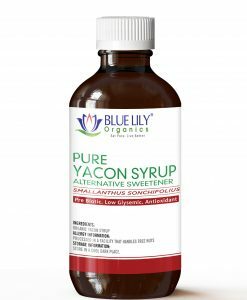 As little as one teaspoon (approximately 3 grams) provides a healthy dose of antioxidants, vitamins, minerals, and other nutrients in an easily-absorbed whole-food form. 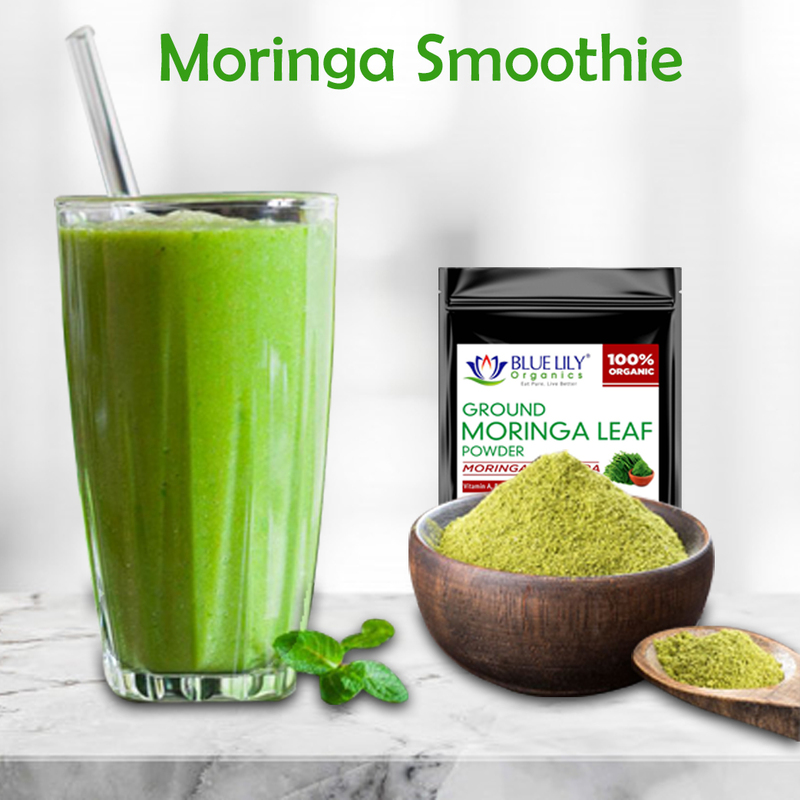 Blue Lily Organics Moringa Leaf Powder can mix in either water or the beverage of your choice. It is a great choice for adding protein and nutrients to smoothies and shakes. Blue Lily Organics Best Moringa Powder can also use in the kitchen to add a healthful boost to any dish. Moringa leaf powder is particularly yummy in sauces and soups. It works as a thickener while providing delicious, nutritious flavor and aroma. Or just sprinkle Blue Lily Organics Moringa Leaf Powder on your veggies, side dishes, salads, and entrees for a healthy dose of green goodness. Our recommendation is to add it to food just before serving after the food. It has been heated so that the nutrient content is preserved. To maintain the potency of Blue Lily Organics Moringa Leaf Powder. You should store in a dark container in a cool, dry place out of direct sunlight. The shelf life of Moringa leaf powder is approximately one year. Keeping Blue Lily Organics Best Moringa Powder in a tightly-sealed container in the refrigerator may extend the shelf life. Blue Lily Organics fresh Moringa Leaf Powder is non-GMO and contains no chemical pesticides, filler, artificial additives or preservatives. Blue Lily Organics Best Moringa Powder is 100% USDA Certified Organic.